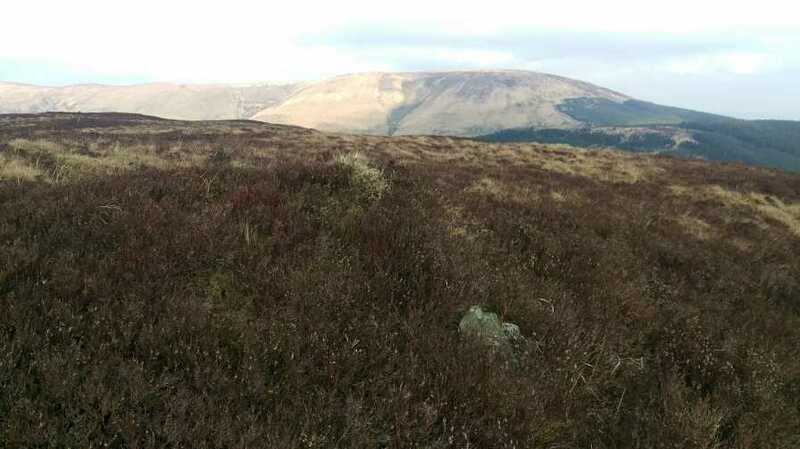 Ballykildea Mountain is the 885th highest place in Ireland. There are many forms of megalithic art hewn into rocks throughout Ireland. Some might be considered functional rather than artwork, and may be maps or represent constellations etc. All come under the general heading Megalithic Art, and can be well over 5000 years old. We are all no doubt familiar with the spirals commonly seen around Newgrange for instance. Some less known forms are called ‘cup marks’ and consist of shallow depressions in rocks. 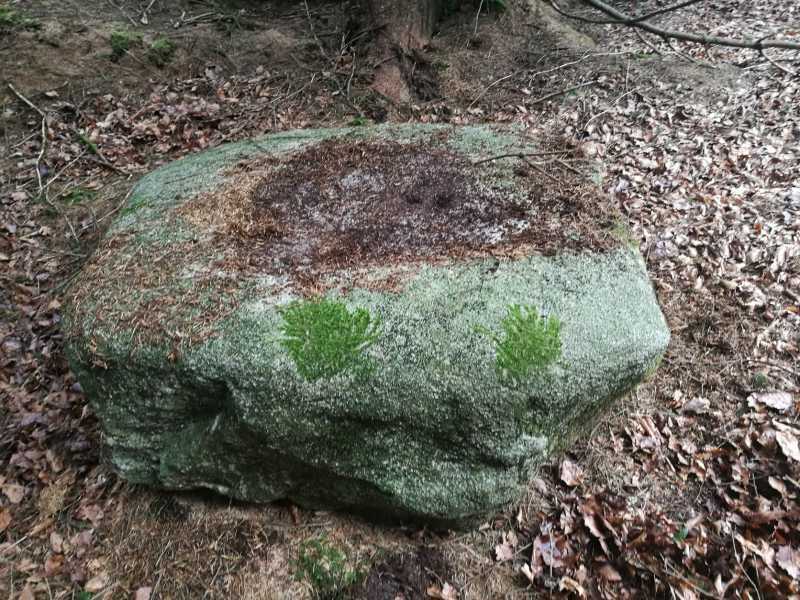 Some cup marks are very simple – just a couple of shallow depressions carved into the rock, while others have elaborate channels and designs around and connecting them. Their purpose is unclear – perhaps a map of the terrain or the skies, perhaps ceremonial, perhaps simply decorative, perhaps the result of a bored shepherd sitting in one place for too long. In Ireland we have about 99 recorded rocks with cup marks. I may have just found the 100th on the slopes of Ballykildea Mountain. As I descended Ballykildea to the south I came across a large granite boulder in the forest. I felt immediately that there was something about this rock. I wiped the carpet of pine needles off the top and saw that there were two shallow depressions side by side. I also discovered a linear marking along one side. Perhaps the linear marking is the result of some long rotted tree that had grown against the rock. And perhaps the two shallow depressions on top are the result of erosion or a chemical process. 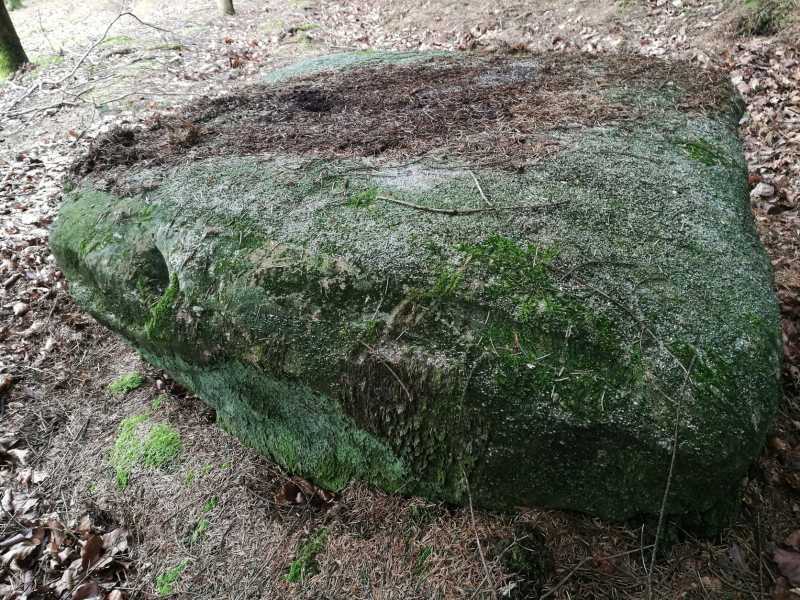 Or perhaps not - this appears to be a granite boulder – an erratic – so a tree would be unlikely to have etched into the rock like that, and if the shallow holes are erosion then why only two? It clearly needs further investigation by experts. Sadly the Megalithomania.com website and twitter account of Tom Fourwinds (Ian Thompson) appears inactive for several years so I cannot seek the wisdom and knowledge of this formidable amateur expert on Irish megalithic art. The national Irish Monuments Service have requested photos and coordinates for further investigation so let’s see where that leads. I tried to imagine what this area was like 5000 years ago when this potential megalithic art was made. With no recorded cup marked rocks in this area it was hard to see a particular context except that perhaps more of these rocks lie undiscovered on nearby hills, and all join to form a bigger patchwork of connected art. Was this a vast forest in the distant past or an area of tilled and farmed land? Was it part of an important route or a remote ceremonial site? Or was it a convenient seat for a bored farmer who passed the time by doodling on the rock with another rock? Another view of the erratic on Ballykildea with potential rock art on it. This side shows a linear mark that may be man made or natural. I will send on the coordinates and photos to the National Monuments service of the Department of Culture, Heritage and the Gaeltacht, and will report back on any findings they make. Picture from simon3 : Ballykildea View. The views from Ballykildea include the Slieve Bernagh ridge and the continuation of the whole horseshoe to Glennagalliagh. 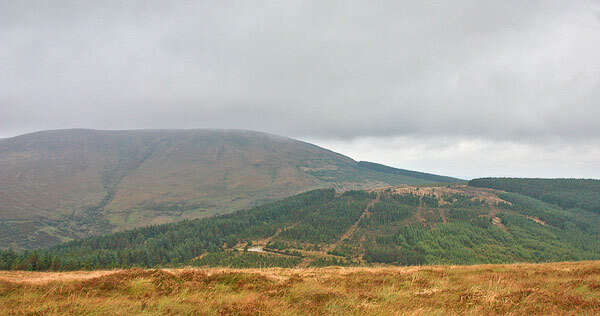 The east end of the ridge, with Moylussa, is shown on the skyline in the picture. Picture from csd : Ballykildea from Cragnamurragh. Picture from sandman : Summit Area .